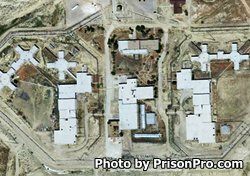 Wyoming State Penitentiary which is also referred to as the South Facility is a high security prison located in Rawlins,Wyoming. Wyoming State Penitentiary is responsible for housing all male death row inmates in the state. This facility holds a maximum of 670 adult male inmates. The original facility was known as the North Facility but was closed in 2001 due to safety concerns, at that time the South Facility was opened. Inmates are offered educational programs that include English second language, adult basic education, GED courses, and correspondence college courses. Vocational opportunities at this facility include welding, carpentry, cabinetry, various construction trades, and computer literacy. Inmates at Wyoming State Penitentiary can work jobs within the facility which include kitchen and laundry duties. Offenders that are nearing their discharge date can take pre release programs to help prepare them for their re introduction into society. The day an inmate at Wyoming State Penitentiary is allowed visitation, will depend on their housing unit, call the facility for the current day. Visits are between 8:00 am- 4:30 pm. You must check-in before visiting, morning check-in is between 7:30- 8:00 am. Afternoon check-in is between 12:30- 1:00 pm.